Raúl Ruiz’s most ambitious literary adaptation and considered his greatest cinematic achievement. 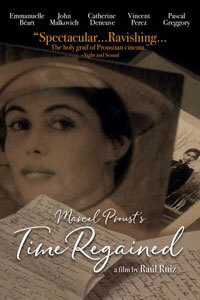 An Official Selection at both the Cannes and New York Film Festivals and starring an outstanding cast of international film stars, including Catherine Deneuve, John Malkovich, Emmanuelle Beart, and Vincent Perez, Ruiz’s Time Regained distills all of Marcel Proust’s iconic In Search of Lost Time into a single epic feature. The film opens in 1922, as Proust is on his deathbed pouring through old photographs that summon the events of his life. Gradually, we watch as his own experiences merge with his own literary creations. Idyllic memories of youth alternate with rich recollections of 19th century Parisian society where the drama of the Great War and the anxieties of the emerging modern era are skewered in the spectacular staged soirees and lush grand parties. In Ruiz’s deft cinematic hands the film becomes a phantasmagorical comedy of manners as well as a powerful reflection on cinema’s ability to seize and preserve moments of time. The result is a montage of moving snapshots and feverish dreams that makes the film the ultimate in Proustian cinema. Lovingly restored and remastered by Le Petit Bureau with support from the Centre national du cinéma et de l’image anime (CNC, France) and enriched by stellar performances, Time Regained is a “gorgeous, meticulously crafted spectacle” (Jack Matthews, New York Daily News). Jeannette is ready to take up arms for the salvation of souls and the liberation of the Kingdom of France.